Ping-Cho and The Doctor are mocking me aren't they? 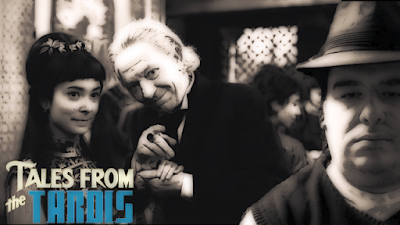 Hello and Welcome to The Basement and Tales From The TARDIS, where I go through each and every single episode of classic Doctor Who on an weekly basis. For those of you who may not know, we are currently up to part 3 of the Marco Polo serial... but wait... how can I be going over something that doesn't exist? Well I happen to have the reconstructed version of the serial that was produced by Loose Cannon Productions. So it is possible my friends! So let's get right to this week's episode, Five Hundred Eyes! The situation is dire, as the water supply is completely exhausted, and our heroes only survive because of SCIENCE! Okay, actually because The Doctor and Susan manage to collect water off of the TARDIS walls because of condensation. That's actually pretty imaginative thinking, and I don't think that solution has appeared in fiction since then. If I'm wrong about that, please tell me in the comments section below. The group makes there way to Tun-Huang, which may or may not be a city in China’s northwestern Gansu Province. The reason why I'm unsure on this when I google it spelled Tun-Huang, I get results for it relating to this episode and for it spelled Dunhuang for the actual location. Anyway, they replenish their supplies and meet up with Tegana... who is quite in shock about them being alive, but he rejoins the group. Also of note, while in Tun-Huange, Ping-Cho tells the storry of Aladdin and the Assassins, which is a nice way to pass the time during their stay... and also fill up time in the serial! Since he's back, no doubt Tegana has some devious things in mind... and he slips away, heading to the Cave of the Five Hundred Eyes, which I believe are actually the Mogao Caves. He meets up with Mongol agents Malik and Acomat who tell him that another, name Noghai has an army and is heading towards Karakorum (the capital of the Mongol Empire). Tegana recruits Acomat to attack the group and to kill Marco and everyone else... but these plans are overheard by Barbara who happened to followed Tegana. Actually she only heard part of what was being said ... but regardless she is found and captured. Tegana returns to the group, where he acts shocked about her disappearance. That dastardly cad! With some leaps of logic, The Doctor figures that Barbara may be at the caves and heads out there with Susan and Ping-Cho... cause bringing Ian along would be pointless? When they arrive, Ping-Cho finds Barbara's handkerchief, and they call out for her... but she can't respond... why? Because she has a knife being held to her throat by a mongol in a hidden chamber. The trio continue to call out for Barbara... but then the episode ends as Susan cries out, pointing at a wall where there are a pair of eyes moving! I love that ending... Carol Ann Ford had like the perfect terrified scream. Anyway this episode, while continuing the 'teaching of history', sees that down-played a little as the story of Tegana plotting his latest scheme takes center stage. Because this serial's story is being told more for its historial aspect, we got the 'survived by condensation' bit, because the TARDIS is 'broken'... and thus we see the first big problem with the historical stories. Following An Unearthly Child, The Daleks and Edge of Destruction stories which featured a lot of sci-fi elements, the more realistic Marco Polo story sticks out like a sore thumb.